My mum turned 70 this month. It's a big birthday worthy of a special present. But, whoa, this one is so unexpected. I'm sending her a Chromebook. Initially, she'll get the Google Cr-48 that Google sent in December for the Chrome OS pilot project. If that works out, I'll then buy her a Samsung Series 5 Chromebook. I would prefer the Acer AC700-1099, because of the lower price -- $350 versus $430 -- but the 11.6-inch screen, which appeals to me, is too small for her. My mom uses an iMac G5 with iSight camera. I have long resented Apple for incorporating the webcam into that model, only to make it obsolete three months later with the early switch to Intel processors. I bought the computer in October 2005. With this month's release of Mac OS X 10.7 "Lion", she is now two generations behind the current release, since Snow Leopard also didn't support PowerPC processors. Still, for her needs, the iMac would be good enough -- except it has started to fail. Vertical lines now show up on the screen, indicating hardware failure -- presumably the graphics chip -- is imminent. She needs a new computer. The sensible thing would be to get her a new Mac. But I simply can't afford to spend a thousand bucks on MacBook Air or $1,200 on a new iMac. Refurbished is an option, but even that is a budget buster right now. I could buy her a perfectly acceptable Windows 7 laptop for even less than a Chromebook and one with much better hardware. But in November 2006, she fell prey to a glitch with Microsoft's Windows Genuine Advantage antipiracy mechanism, which tagged her copy of XP as counterfeit; it wasn't -- I configured that laptop myself. Months later, after being infected with a couple different pieces of malware, I sent her the iMac and she has been malware-free since. Mum will never use Windows again. That's not meant as a criticism of Windows 7, which I regard to be an excellent operating system. So, what the hell, why not try something radically new and yet surprisingly familiar? As I expected, after asking, mom spends most of her time on a computer in a web browser -- Firefox, which she loves. The default Mac browser is Safari, but Firefox, which she often calls FoxFire, is her preference. Damn, she would be a good candidate for Mozilla's proposed Gecko-based browser OS. But that's years away, and I need something now. I proposed the Chromebook as a replacement option about two weeks ago, and mom was lukewarm -- not by any means cold -- to the idea. Neither of us could think of anything she wouldn't normally do for which the cloud and web apps wouldn't be enough, with occasional printing being the only exception. A few days later, my niece visited mom -- and WTH -- she has used Chromebook. Actually, she was quite familiar with Chrome OS. With a beloved granddaughter there able to help, my mom's confidence to make the switch increased. She told me to send the laptop. But first, I wanted to make some preparations, starting with switching mom from Firefox to Chrome, so she could become familiar with the browser and so I could sync up bookmarks and get her email in order. My sister visits mom once a week, on Tuesdays, and last week she called asking for my instructions. Dumb me, I should have seen the problem coming. Sis downloaded Chrome but it wouldn't install. The browser doesn't support that old of a Mac OS version. She did begin the email migration process, however. Mom needs to make Gmail her primary and forward messages from the other accounts. My God! The woman has accounts on four other services -- her ISP, Apple, AOL and Yahoo. Apple's MobileMe, which is being retired, is her primary email service now. I walked my sister through the changes needed to be made to mom's Gmail account. But she shocked me, when instructed her to type in "mail.google.com". She didn't understand. Why not gmail.com? I explained that Gmail is a Google service. "I didn't know that", she answered. Hey, sis, is only months back in the states after doing missionary work with her husband in Guatemala for years. She's a little out of touch. I had her go into settings and make sure IMAP was checked and to change the theme to the exciting new "Preview". She then moved on to forwarding messages from the other services and dragging email from the other accounts into Gmail using Apple Mail. That synced the messages to the Gmail server. Gmail makes sense for another reason. Mom is on my family cellular plan, and she has the original T-Mobile MyTouch. In a few months, when her T-Mobile contract expires, I'll buy her a Nexus S (or its successor); the phone is $99 with new two-year contract. She'll stick with T-Mobile if the AT&T merger falls through, or I'll switch her to the parent carrier. MyTouch is an Android-based phone, which uses a Google Account to activate. Setting up the Cr-48 should be straightforward, and I'm looking forward to it removing many hassles trying to remote-admin mom. I can log into her Google account to handle most things. When it's time to switch her to the Series 5, assuming she takes to the Chrome OS experience, all she'll need to do is log in with her Google account and everything will be available her to. Setup is one of the biggest pluses. Mom's needs are basic. She goes on the web or plays games. The kind of arcade games she likes are available from the Chrome Web Apps Store. 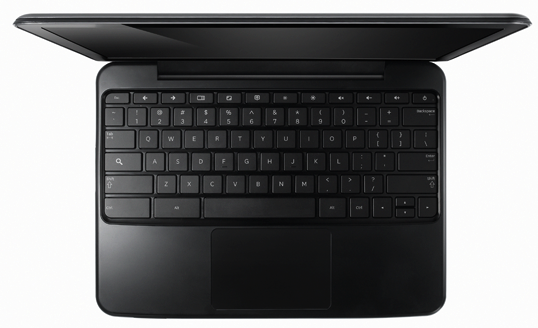 The Samsung Chromebook should be more than enough for her daily computing needs. She already lives in the browser. I did consider buying iPad 2 or Galaxy Tab 10.1. Either tablet would be enough and perhaps better because of the apps. But she has dropped and broken three wireless mice in the last 18 months. The laptop will be stationary. A tablet would be mobile and more likely busted. I'll report on her progress in a few weeks. The Cr-48 arrives in a few days. Mom's no computer geek, but she's intelligent and has shown surprising aptitude using a PC. Like me -- and I guess I inherited this from her -- she welcomes change, even in her advanced and stereotypical set-in-her-ways age. A couple months back, my colleague Larry Seltzer -- after dissing Chromebook -- asked if he should get one for his daughter. What about your mom, Larry?